What’s in the bag? What’s in the bag? WHAT’S IN THE BAG? What’s in the bag, Hobin? 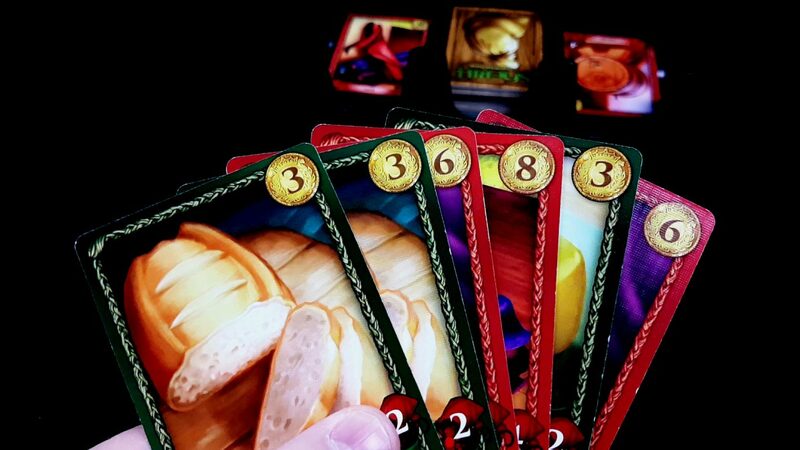 So, let’s get this out of the way early – I absolutely love Sheriff of Nottingham. 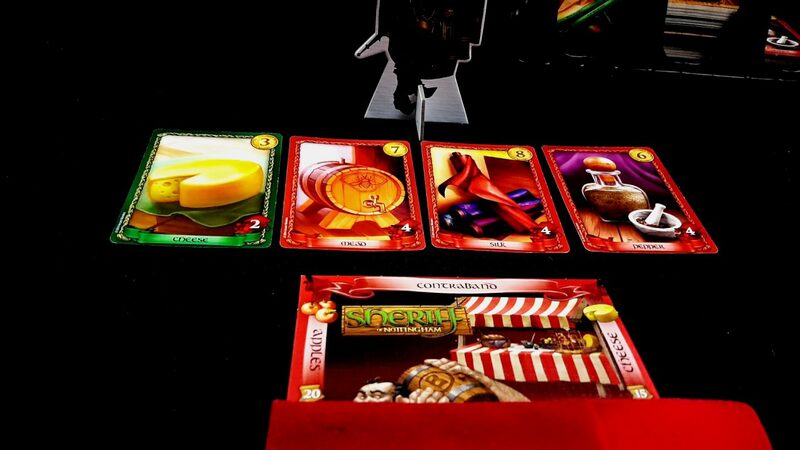 Along with Dixit, it was one of the games that was an unquestioned hit at family game night, and generated much hilarity as we grilled each other over the hypothetical contents of our bags. 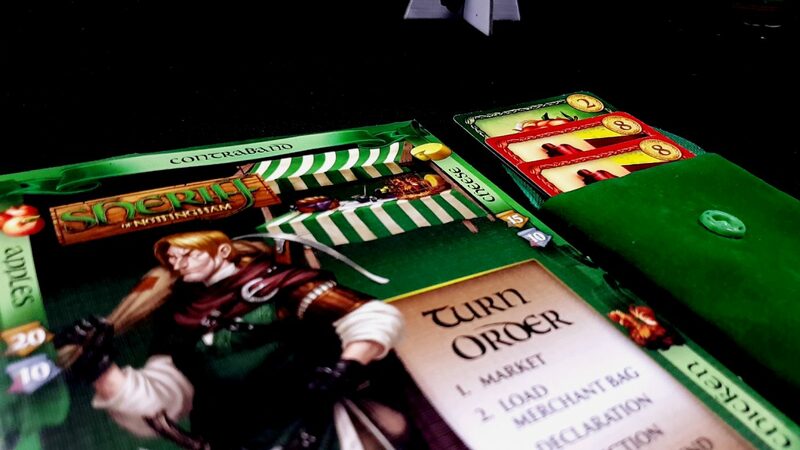 Sheriff of Nottingham is primarily a game of interrogation, but it’s at its best if people are willing to put in just a little bit of role-playing to spice things up. We each take the role of merchants heading to market with bags full of produce. In the town of Nottingham, there are only a grim, depressing handful of grim, depressing things available legally to buy. in that respect it’s very much like a Lidl in the Scottish Highlands. 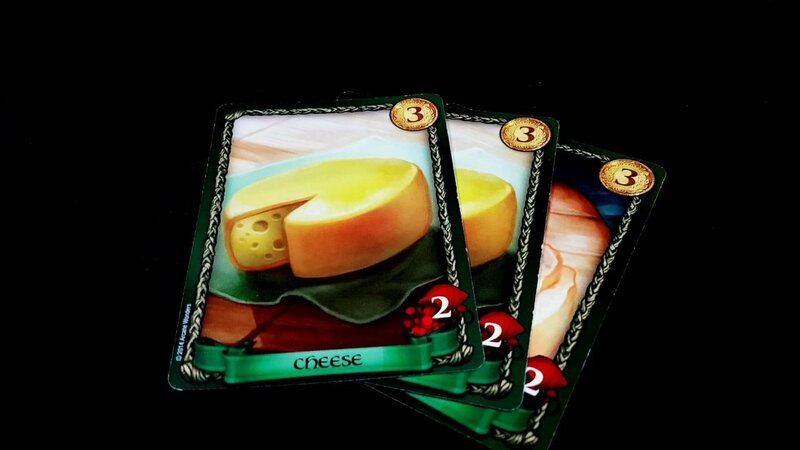 In Nottingham, merchants are permitted to sell only cheese, bread, chickens and apples. Everything else is contraband, and must be forfeited if the Sheriff finds it in our possession. If Prohibition taught us anything though it’s that the free market finds a way to meet demand. That way is us! Ahem, sorry, Sheriff. I didn’t see you standing there. May I suggest that you’re looking especially radiant today? That new doublet really brings out the blue in your eyes. An azure blue, like the sea on a sunny day. What I meant to say is that the *other* people coming into market have a reputation for flaunting Prince John’s very sensible trade restrictions, and if I were you I suggest I would be doing God’s work if I were to force them to reveal the contents of their bags for inspection. In fact, I feel so filled with the Holy Light of God’s wisdom that I would be willing to pay you five silver pieces if you too would join me in seeking His glorious approval. Look at this rogue’s gallery. I’m opening every one of your bags. 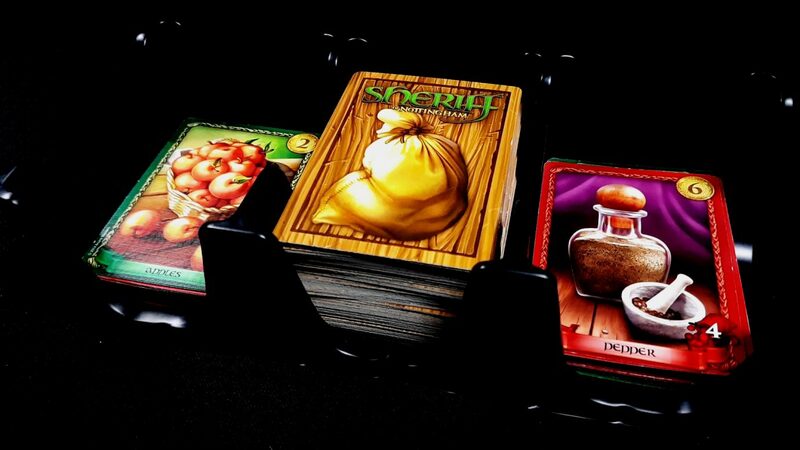 Upon picking our player, which is largely just a thematic colour choice, we also pick up the thing that makes Sheriff of Nottingham such a joy – the pouches that we will use to smuggle our contraband into the marketplace. But we’ll get to that. I’m an honest businessman, I’ll have no truck with illegality. Now I get to draw three more. I hope they’re legal, officer. I can work with this. Officer. Once everyone has their goods in hand, a player is picked to be the Sheriff. They don’t take goods to market, not this turn. Instead, they have to work out whether any of the other merchants are trying to pull a fast one. Under the watchful eye of the Sheriff, everyone else secretly places a hand of goods into their bag, and seals it. They can play up to five goods at a time, making use of any combination of the items they have available to them. They’re going to have to make a declaration to the Sheriff though, and it can’t be *entirely* fraudulent. Being Good Christian Folk in a Good Christian Time, upon being asked by the Sheriff as to the contents of their packages, they must be honest about the number of cards in the bag. And they must also declare that they are bringing through a legal good. So, if I am bringing through five chickens I can say ‘I am bringing through five chickens’. Or if I like ‘I’m bringing through five apples’. What I can’t say is ‘I am bringing through three chickens’ or ‘I am bringing through five crossbows’. The number of cards we play is always truthful. Everything else, well – truth is subjective, innit? So what *is* in the bag? My bag? Why, Sheriff, I’m an honest trader. Honest Marion they call me. I would never dream of trying to break the law for my own petty profit. I sir, am bringing four cheeses to market. Sorry? Indeed, sir – four cheeses is an implausible number of cheeses to bring to market so early in the season. The dairy though has been good to me and as such it is important that I clear these from my warehouse so as to make room for the crossb…apples that I have coming in from France. So, I declare to you honestly and truly, that I have four cheeses in my bag. The sheriff takes hold of our bag. Weighs it in one hand. Frowns. 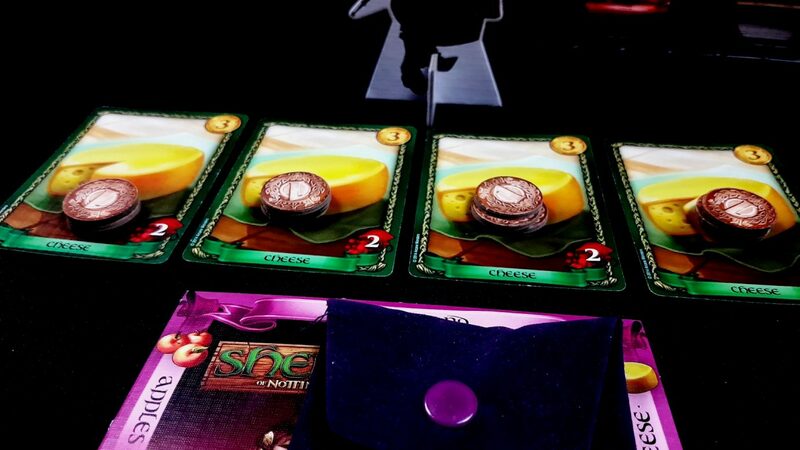 Now we’re in the the beating heart of Sheriff of Nottingham – the interrogation. You see, we *want* the sheriff to open our bag – if we’re inspected and we were honest about our goods, the Sheriff has to pay us for the inconvenience. Each card has a penalty on the bottom right, and for each honest good the Sheriff has to give us that money. We also get to keep the goods and sell them in our market stall – we don’t get any actual money for this, but it does count towards our score at the end. However, if the Sheriff inspects our bag and we are carrying contraband, that gets confiscated (discarded) and *we* have to pay a penalty to the Sheriff! So, we want the Sheriff to open our bags when we’re legit, and we don’t want our bags opened when we’re not. That’s the game. But layered on to this is the fantastic meta-game of bluff and intimidation, because this phase goes on as long as the Sheriff wants, until the point the bag is returned to the merchant or it’s opened. The Sheriff can choose to put a bag temporarily aside. ‘I’ll come back to that one. Have a think about how much its safe passage might be worth to you’. The Sheriff can choose to make it dependant on what he or she finds later. Or, the Sheriff can choose to negotiate with a merchant, or vice versa. But this is fraught – offering a bribe for the Sheriff to let you pass might be tempting, but it also makes you look suspicious, which you don’t want. Unless you are completely legit, in which case you might want to offer a bribe that is small enough to be insulting, but large enough to be suspicious. Unless that’s what the Sheriff thinks that’s what you’re *trying to appear* like you’re doing. Is it a bluff? Is it a double bluff? Is it a triple bluff? HOW DEEP DO THESE BLUFFS GO? The bags make a great clicking noise when they’re opened and closed, and that’s the sound that negotiation is over. The Sheriff opens our bag, and finds our four cheeses. I’m sorry for your loss, Sheriff. Chastened, the Sheriff turns to Little John. ‘What’s in the bag?’, he growls. I am shocked, SHOCKED, to find contraband in this bag. There’s a chink of coins. I honestly thought we would be friends, Hobin. Then, the Sheriff role is passed on to the next player, and the game continues until everyone has been the Sheriff twice (or three times, in a three player game). I can’t over-sell how much sheer joy goes into this interrogation process, especially if you are willing to get into the spirit of things. It’s not a complicated game in the slightest, but it is a very *deep* game of reading the people around you. You need to pick up on when someone is *too* keen for you to take a bribe, and work out whether they’re just *trying* to look too keen. If someone straight up refuses to bribe you, maybe they’re just completely honest – no reason why an honest person should bribe you. But then, if you had a bag full of crossbows, wouldn’t you *want* to look honest? And anyway, three apples – you can eat a penalty of six coins just for the chance that you wipe that smug, butter-wouldn’t-melt grin off of Hobin’s face. Open the bag, Hobin. OPEN THE BAG. But what if he’s playing you? DON’T OPEN THE BAG, HOBIN! It’s so close to being the perfect family game, but it has a few minor issues that make it stumble at the dismount. 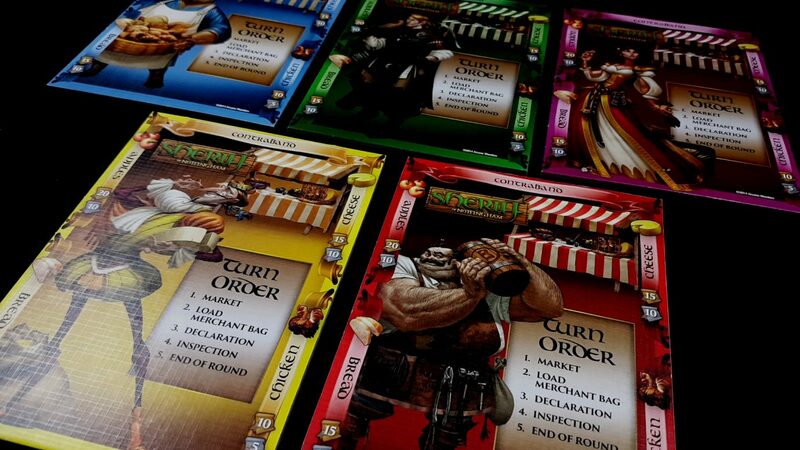 The first of these is that it supports only five players (although you can jury-rig a sixth player by having the sixth one use the Sheriff’s bag, and make their own market stall card). That’s a low ceiling on a game like this, with no obvious reason as to why it should cut itself off in that way. True, all you need is a bag to make the game work with more, but so much of it comes from the thematics and the sounds of the clicking button that I’m not sure you wouldn’t lose something by improvising. The second issue is that the end of game scoring is just… awkward. Each of you has to total up the face value of your market cards, and then the value of your money, and then work out which players have the most of each individual good and what fraction of the first and second place bonuses for each should be allocated to each player. It’s not hard, as such, it’s just cumbersome and when you have four people all counting out loud you end up needing a pen and notebook to just work out who won. There is an app you can get that can do all of that for you, but while I am all for digital intervention to support gaming, I don’t think it excuses this kind of po-faced book-keeping. And then, some of the rules are weirdly prim and proper – there are rules over what makes for a ‘legal bribe’ and under what circumstances it must be honoured. 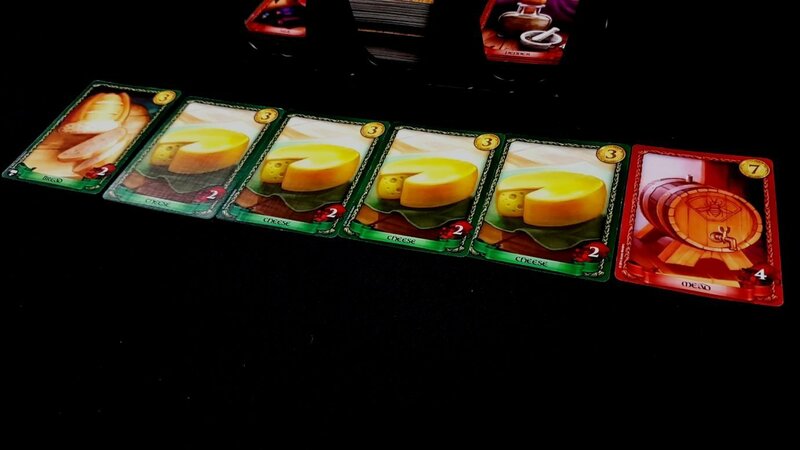 There are cards you need to remove for a three player game, so you need to hunt through the deck to extract them. There are ‘special’ cards that are for advanced play, and yet they are no more complicated or interesting than the others. There are also way too many cards in general – it makes shuffling them a pain in the backside since you need to divide decks, shuffle them independently and merge them back in. Why are there two discard piles? Does it really add anything? The core game is beautifully elegant, but these weird aberrations are like rough edges on a polished piece of wood. My advice is to ignore most of them. These are quibbles, yes. And they absolutely should not dissuade you from picking up this absolute jewel of a game. You’ll need a minimum of three people to play it, but if you can get them together you won’t regret opening up the box. But having said that, what’s in the box? What’s in the box, Hobin? WHAT’S IN THE BOX, HOBIN?